I grew up in a family of readers and my fondest memories of childhood revolve around Mommy and Daddy reading to me and when I grew older, getting my own library card and biking to the library all by myself to check out huge stacks of books to devour. My hubbie grew up in a family that was even more bookish than mine. With that kind of devotion to the written word it shouldn't surprise me that we are now in the midst of raising four book loving kids of our own -- big brother followed just a year later by triplets. When the kids were babies we constantly read to them individually and collectively, and as they grew older they started to read to us. As a matter of fact, even though my children are now teens, all six of us still enjoy going together as a family to hang out at the local library and at new and used bookstores to browse the shelves. A Baby Boomer, I grew up in a household where Dad subscribed to National Geographic Society Magazine. Not unlike other fathers of the 1960s era, my Daddy kept every back issue neatly lined up on our bookshelf at home in chronological order so my siblings and I could keep going back to them as we grew up whether it was to read for fun or to research a school project. Well over 100 years old, National Geographic Society has expanded its empire today into everything from magazines, books, and DVDs to films, school programs, interactive media and much more. 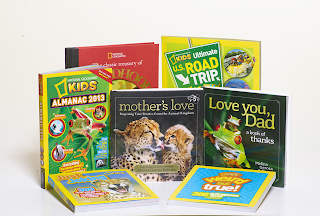 As the seven new titles I'm about to tell you about show, National Geographic still is adept at engaging young and old -- publishing books that link the generations. Books that are noteworthy not only because they entertain and educate by leveraging fascinating content and world class photography, but because they also inspire a lifelong love of reading. Perfect for a memorable Father's Day gift or any other day of the year, this is a book that will continue giving pleasure to all those who share in reading it. Spectacular photos of both domesticated and wild animals side by side with the perfect sentiments that are a segway to all the reasons why fathers really do know best. Authored by internationally published real life mom Melina Bellows, Chief Creative Officer for Books, Kids, Family at National Geographic. Moms are moms 24/7, 365 days a year and no book honors the first woman in each of our lives better. By the same author of I Love You, Dad, this is another beautifully photographed book accompanied by the perfect heart-felt prose. Makes a great gift for mothers as well as a title children will enjoy reading again and again. This is the brand new annual edition of the world's best selling kids almanac. From exploring new cultures to fascinating facts about the wonders of nature to history, dinosaurs, geography and space this book covers it all. Features the stunning illustrations and photography that National Geographic built its business around. There's even a new game section in this version plus a code to scan that will lead you to lots more fun online. Next up is a fun read with more than 100 silly animal photographs like a buck teethed zebra and a whole bunch of other wacky creatures telling knock, knock jokes. Kids will actually be learning about the world around them, too, while at the same time laughing their bellies off reading this absolutely hilariously funny new book. The actual facts in this paperback will blow minds of moms, dads and kids and almost everyone that reads this will certainly learn something new. For example did you know that there is a British website that sells land on Mars and Venus for the equivalent of about $29 U.S. dollars per acre? How about this: A tiger's skin sports the same stripes that are visible when looking at this animal's fur. Amazing stuff, for sure. Comes complete with a Fact Finder index in the back making it easy to look things up by subject. A book that's chock full of classics to read and inspire tactile activities for children. My favorite: A Secret Place by William Shakespeare which also includes the how tos for kids to make their own simple fort or hideout indoors or outside. A collection of classic poetry, rhymes and more that stimulate creative play like making a fairy house and even arts and crafts. Some photographs but mostly very lovely illustrations that all ages will appreciate. You won't want to pull out of your driveway for the next family road trip without this gem. For sure if you give your kids this book to keep busy, I doubt you'll hear "Are we there yet?" much if at all. State by state, there are maps, games, activities and all manner of fun to keep the little ones from fighting with their siblings in the backseat while you try to drive. Yeah, I know all about that, been there, done that, LOL. Definitely an investment in parent sanity in my book. These National Geographic Kids titles are available online and in-store wherever books are sold. You can also purchase any or all of these direct from National Geographic here. If you can't decide which of these National Geographic books to buy for your own family, I have really good news. Read on about entering MBE's latest giveaway contest and you could win the entire collection reviewed! Just leave a comment(s) below this post. Contest ends July 9, 2012 at 12 midnite PST and is open to legal residents of the U.S. only. Prize: One winner will win all SEVEN (7) National Geographics Books featured with an approximate retail value of $75. Selected at random from all entries and will be notified via email. Simply leave a comment below this blogpost saying which of these books you like best. Don't forget to include your email address, Facebook and/or Twitter contact info in the comment section so the winner can be contacted. FTC Disclosure: National Geographic Books provided the titles to facilitate this review and also the 7-book prize package being given away on this blog. 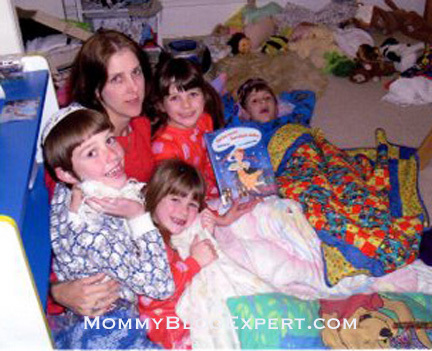 MommyBlogExpert did not receive any other payment or compensation associated with this post. See complete FTC Disclosure information that appears at the bottom of MommyBlogExpert's main page and at the bottom of every individual post on this blog, including this one. The Classic Treasury of Childhood Wonders is my favorite. National Geographic Kids Almanac 2013 is my favorite. Mother's Love, Autographed by the author Melina Bellows would be my favorite. b/c we just got back from our latest road trip!